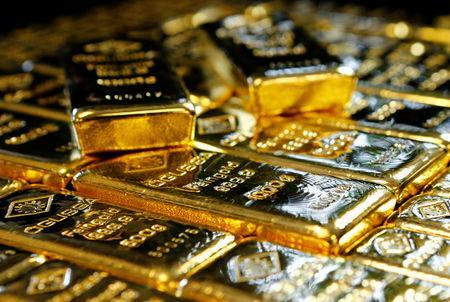 (Reuters) - Gold retreated on Tuesday from more than three-week highs in the previous session after the dollar rebounded and risk appetite and bond yields recovered as fears eased about a possible U.S. recession. Spot gold was down 0.5 percent at $1,313.82 per ounce as of 13:55 p.m. EDT (1755 GMT), after hitting its highest since Feb. 28 at $1,324.33 on Monday. U.S. gold futures settled down 0.6 percent to $1,315 per ounce. "The trend of the U.S. dollar has reversed a little bit and at the same time there was a bounce back from the lows across yield curves," said Bart Melek, head of commodity strategies at TD Securities in Toronto. Benchmark bond yields ticked higher on Tuesday after a few days dominated by recession worries, which prompted investors to seek safe-haven assets such as gold. An inverted U.S. yield curve is widely seen as indicating an economic recession. "The firm U.S. dollar remains a big impediment (for gold)," Melek added. "Even with a very dovish U.S. Federal Reserve, the market is still looking at other asset classes such as equities. Until that turns a little sour we should probably not see huge inflows into gold." The dollar index was up 0.2 percent. A higher greenback makes gold expensive for buyers holding other currencies. Gold has gained about 14 percent since touching more than 1-1/2-year lows last August on a dovish U.S. Fed and global growth concerns. Calm returned to global markets on Tuesday, with gains on European and Asian bourses and the higher bond yields. The 10-year U.S. Treasury yield edged up, having fallen below the yield for three-month bills on Friday for the first time since 2007, inverting the yield curve. "Overall, though, conditions remain supportive for both gold, and to a lesser degree silver, to stage a rally. We need to see further price action and some technical confirmation to increase our conviction that gold and silver are indeed headed higher," Fawad Razaqzada, market analyst with Forex.com, wrote in a note. "The fact that gold has held key support around the $1,275-$1,285 area is bullish, as the move below the long-term pivotal $1,300 hurdles proved to be temporary." Investors were watching for the latest round of China-U.S. trade negotiations, scheduled for Thursday in Beijing as well as lawmakers' bid to break a deadlock over Britain's plans to leave the European Union. Lawmakers will vote on a range of Brexit options on Wednesday. Palladium fell 2.2 percent to $1,541 per ounce after touching its lowest in about two weeks at $1,532.56 in the previous session. Silver was down 0.7 percent at $15.42, while platinum rose 0.3 percent to $857.79 an ounce.